It was the day before the annual BlogHer conference in Chicago. 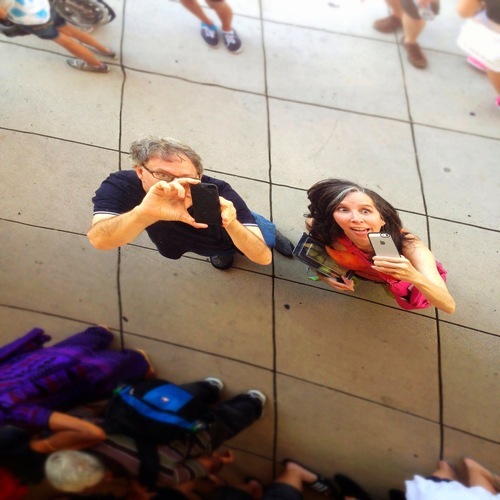 JC and I made plans to stroll down Michigan Avenue and explore the city. If you don’t know JC Little (The Animated Woman), take a look at her delightful and somewhat repulsive presentation about pinworms at the Voices of the Year ceremony. She’s my kind of person. 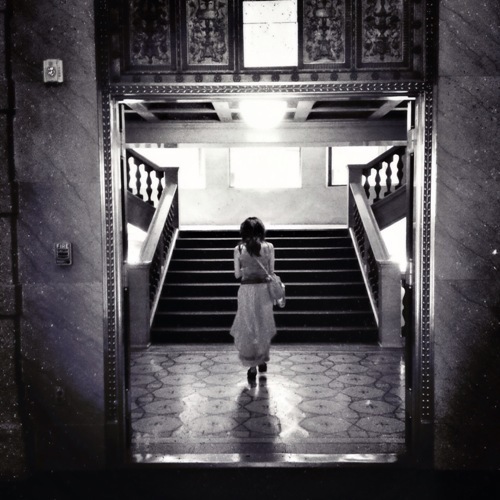 During our walk, we found ourselves in the architecturally-interesting Chicago Cultural Center, and noticed that there was an art show on the fourth floor gallery. 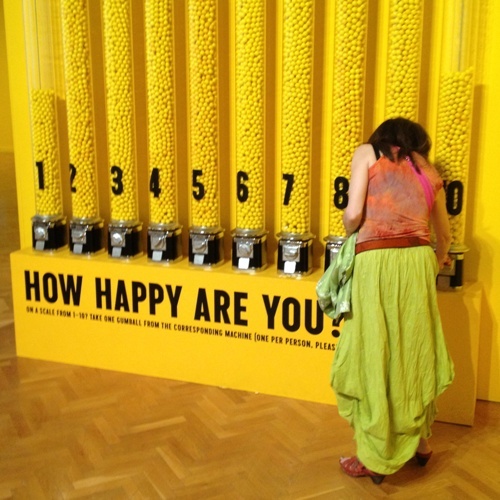 It was titled “The Happy Show” and the installation was by Stefan Sagmeister, a prominent designer from New York. 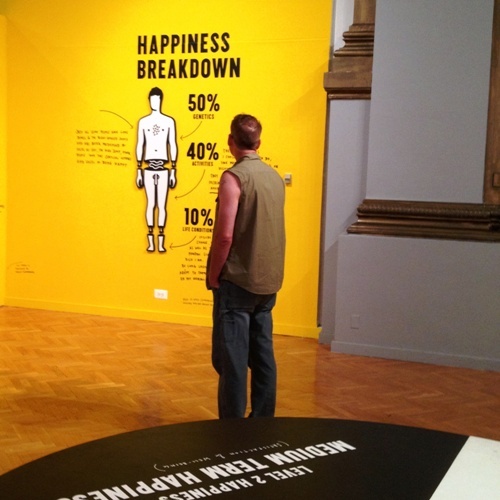 The Happy Show offers visitors the experience of walking into the designer’s mind as he attempts to increase his happiness via meditation, cognitive therapy and mood-altering pharmaceuticals. “I am usually rather bored with definitions,” Sagmeister says. “Happiness, however, is just such a big subject that it might be worth a try to pin it down.” Centered around the designer’s ten-year exploration of happiness, this exhibition presents typographic investigations of a series of maxims, or rules to live by, originally culled from Sagmeister’s diary, manifested in a variety of imaginative and interactive forms. — from the city of Chicago website. I thought about my level of personal happiness before I approached the gumball machines. I decided that I was relatively happy. Even with some bumps in the proverbial road, I had my health, good friends, my hair, and I wasn’t bored yet with my existence. I took a gumball from machine #7. That put me in the top 25% of happiness. I laughed. It’s the little joys of life that enable a person to be happy. “It’s your turn,” I said, almost a dare. JC walked to the row of gumball machines and turned the handle of machine #10. A bright yellow gumball dropped out. “#10?” I shouted, rather stunned. Maybe she was confused by the instructions. She was Canadian, after all. “You realize that #10 means #10 in happiness.” I mansplained. I left it at that, but by the time we were back on the street, at “the Bean” in Grant Park, I couldn’t hold it in any longer. Her choice had annoyed me. “How can you put yourself as #10 in happy?” I pushed again. Two days later, I met JC during one of the keynotes. It was the day after her presentation at the Voices of the Year. “You were great last night,” I said. 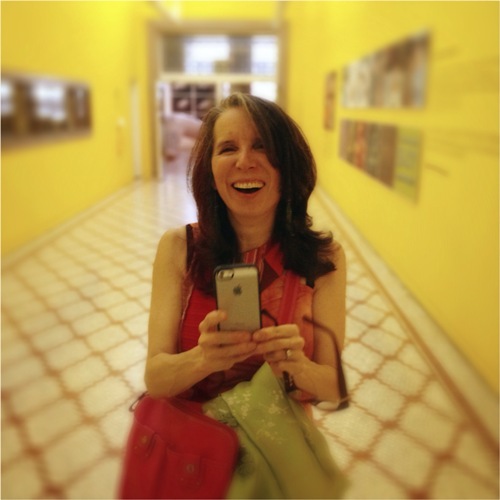 It’s been a month since BlogHer. Last night, I had a dream. I was standing in front of the row of gumballs in Chicago, ready to make another choice. I gazed at the yellow balls of sugary gum enclosed in reflective glass tubes, and then I went for it. But this time, rather than taking a gumball from machine #7, I turned the lever of machine #6. Tch Neil. I didn’t actually get any gum because #10 wasn’t working. And neither was #1. Both, interestingly had the most gumballs missing. Was it fixed? Somehow reading this here makes me even happier than ever. Stefan Sagmeister has obviously never seen Spinal Tap. I remember that #10 wasn’t working. But it somehow ruined the story, so I glossed over that fact. I agree it makes the story better. I’m just bummed I didn’t get any gum…! Punishment for daring to define happiness…do you think the artist purposely made #1 and #10 dysfunctional? I liked hanging out with you. I expect the #1 set is also low due to the lack of clarity in the instructions. Missing, is the typical condescending-sounding-but-likely-necessary “where 1 is the lowest level of happiness and 10 is the highest”. I would have had exactly the same reaction but I wouldn’t have been able to keep asking her. I love JC’s outlook on happiness. And your photos, Neil. I would never go for #10… even though I consider myself very happy! And I bet, too, that #1 and #10 were broken on purpose. I wonder if some people then move over to the second-most-accurate. I love that JC is happy. I also love that she would have been happier if her pants fell down. When funny/weird stuff like that happens to me it’s a seratonin (sp?) boost. But like you Neil, I would have reacted similarly with one of my friends in that situation. I’m not sure if I’ve ever reached a 10. Every time I go to therapy my Dr. asks me to rank my depression and anxiety levels. Depression is typically a 3 unless I’ve had a bad week and anxiety is usually a 5 or 6 (probably b/c I’m anxious that I have to tell how anxious I am). So if I average the numbers, I guess I stay at about 6.5 happy. For me 9 or 10 happy would have to be the result of something insanely awesome that I can’t even fathom happening. I love the photography in this post too. It looks like it was a pretty awesome exhibit. So you are relying on external events for happiness? I have different views of this happiness thing. I do not believe we should aim for living in happiness all the time. I feel that contentment is our baseline with happiness living above and unhappiness living below. You dip into both extremes throughout your day, your life. But to live in either extreme all the time is not possible, nor beneficial. Aim for contentment. The other two will come with it. ‘Aiming’ for happiness all the time would feel insincere. I wonder if I aim at all…I definitely don’t walk around with a smile plastered on my face all the time. Just ask my kids. Jennifer, I really like this view of things. Contentment seems like a very worthy goal. There is so much focus on striving for “happiness” that many people are dissatisfied with their lives, and have trouble seeing the good of the every day. Happiness, I would have went for a 7, maybe an 8. I am blessed by a lot in my life but I have been afflicted with always wanting more, better. It’s a damned curse. My happiness 10 is a moving target. Even in those moments of 9.5, I always find a scenario that could be better. It gives me something to strive for and it works out expending my nervous energy because I am a true believer in failure is not an option. I suspect, I will achieve level 10 happiness about 3 days before I die because that is how my life works out:) Be happy Neil. And JC, you are so damn cute and laid back, I hope your 10 happiness stays with you always. I love this — I’ve long pondered why I’m basically very happy despite my life sort of sucking right now. JC has explained it to me. Thanks to both of you. I’m with Neil. I woulda chosen a 6 ish. I envy JC’s 10, fixed or not. And I’d rot my teeth for a few minutes b/c those kind of gumballs never last long taste-wise and become like chewing cement after 15 minutes. oh what an interesting way to look at happiness. For me, I love that they were yellow, even if I was feeling 7ish, I would probably aim for an 8 because of the color of them. YELLOW makes me happy. I can’t claim a 10 right now, but an 8…sure, why not? I don’t think I’ll ever consider a 10 any more than I consider a 1. I’m always more moderate with these kinds of things. I admire that JC and others could choose it, though, and that maybe knocks me up a number. I love that you guys talked about being a #10. I love that there are different numbers and that’s ok.,\ I know that the 4 and 5 days I have make 10 that much sweeter. Neil, this was a very entertaining story. I’m probably more of a #7, too. Maybe #1 and #10 were broken to show that if you chose #1, things couldn’t REALLY be that bad, and if you chose #10, you were not being realistic. A social exercise with a damper, as it were.